Every morning on the beaches of Chittagong, some 15,000 men go to work knowing that they could die that day. For 16-hour shifts, workers in Bangladesh's largest shipbreaking zone are sent with little protection or guidance into other nations' aging vessels to pull their hulls apart by hand. Inside the ships they face a haze of thick, black smoke from the torches used to cut the metal, unstable gases, asbestos, lead and mercury. By some estimates, one shipbreaker is killed every day by the explosions, fires, or falling metal of South Asia's shipyards. Those who survive face a high risk of cancer and other illnesses. Most shipbreakers work five or six years before they return to their villages, young old men, too worn out or sick to make a living. Syeda Rizwana Hasan, 41, is one of the few advocates for these men  and the beaches where the contaminated ships end up. 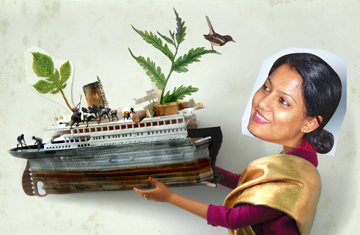 As chief executive of the Bangladesh Environmental Lawyers Association (BELA) for the past six years, Hasan has struggled to bring better environmental and labor regulation to Bangladesh's 36 shipbreaking yards, where, she says, "nobody is present" to ensure labor laws are followed or international guidelines against toxic waste-dumping are met. While the 150 or so ships that go through the yards every year generate much needed revenue and jobs for Bangladesh, Hasan says the government has not "taken into consideration the other argument: It's better to be jobless than to have a job that gives you cancer." Hasan's work has never been more important. As global trade shrank last year, shipping companies decommissioned more and more ships and sent them off to be broken up. Rising labor and environmental costs were already driving companies in France, Greece, Japan and the Netherlands, among others, to outsource more of this difficult work. That extra business has pushed up the number of child laborers. A quarter of Bangladesh's shipbreaking workforce is now under the legal working age of 18, according to Muhammed Ali Shahin of the Brussels-based NGO Platform on Shipbreaking. "Children are easier to exploit," says Shahin. "You can force them to do whatever you want." The impact on the earth is just as dramatic. In 2003, Hasan petitioned Bangladesh's Supreme Court to certify that all ships arriving in the country for breaking were free of toxins. In March, the court ordered the closure of all yards operating without government environmental clearance  in other words, all of them. The court also imposed new restrictions mandating that ships identified carrying harmful chemicals be denied entry to Bangladesh; all ships allowed in now need to be "precleaned" for toxins. Those victories  and the fact that Hasan won a Goldman Prize this year  have the activists' enemies riled. Hasan and Shahin say posters in some yards threatened to "crush the bones" of those fighting for tighter regulations. The Supreme Court has also since reneged on its ruling on noncompliant yards  a move that Hasan is fighting in appellate court. She has stopped visiting the yards herself because of the risks, but says her opponents' threats will not stop her altogether. "I don't want the outside world to think of Bangladesh as a dumping site," she says. "It is against my dignity. It is against the dignity of my nation and the dignity of the people."